On this day in 1977 at 08:10am, rail commuters from the Blue Mountains to Sydney were crushed by the Granville concrete road bridge falling on the train killing 83, maiming more than 200 traumatising, some 1300 involved especially the emergency service workers, and end up destroying hundreds of connected families for the rest of their lives. Travelling express at the normal 78kph, towing eight packed carriages on its morning commute from the Blue Mountains towards Sydney, the locomotive derailed as it entered a left hand curve near Granville, striking a bridge pier. It brought down hundreds of tonnes of concrete on top of two packed carriages. Sydney shocked and united, saw “people lying on the grass in the inner city parks donating blood in unprecedented numbers, we all felt so helpless but wanted to help.” – Graham. The funeral bell tolled for them and all of Sydney, for it was the most shocking, horrific, deadly, unnecessary, worst train disaster every to occur in Australia. Neglected rail tracks were known to Neville Wran’s NSW Labor Government at the time.The Granville bridge had aged piers too close to the rail tracks known to Neville Wran’s NSW Government at the time. The locomotive had a badly worn front left wheel known to Neville Wran’s NSW Government at the time (confirmed by Barry Gobbe, the first ambulance officer on the scene that day in 1977). Rail workers had spotted the defective wheel on electric locomotive No. 4620 a staggering six months before the January 18 crash, but because of Wran’s NSW Government cost cuts, trail maintenance workers had no spare sets to replace the dangerously worn-down leading wheel. Instead of taking the locomotive out of action while it was fixed, it was kept in service. “By the time it ran off the track they’d let it run for another 50,000km,” Gobbe said. The coroner, Tom Weir, responsible for investigating the crash was intimidated and “harassed” by Neville Wran’s Government’s Chief Stipendiary Magistrate Murray Farquhar and others to stay silent about the wheel, according to Gobbe. The locomotive with the defective left front wheel ploughed into one of the support trestles of the overhead Bold Street bridge. The NSW Government inquiry found the primary cause of the crash was the poor fastening of the track on the bend – a consequence of inadequate maintenance. 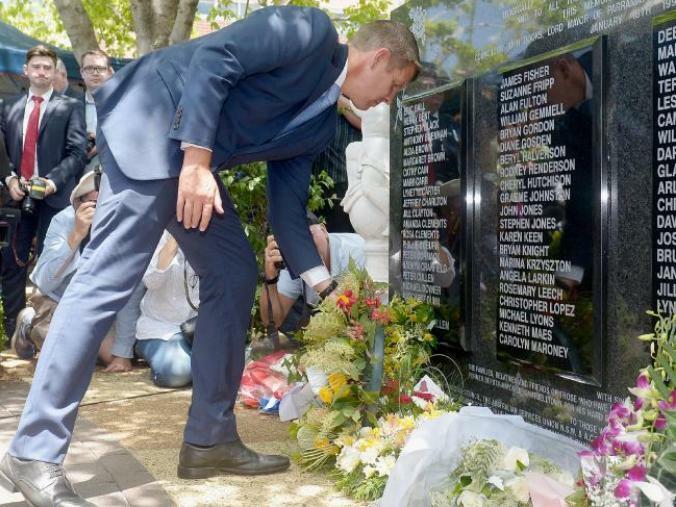 Forty years after it happened, the NSW State Government has gestured a token apology, yet another plaque (with misspelt names) and a few bunches of brightly coloured roses for survivors, friends and family of the victims to throw on to the railway tracks from the current bridge. As if that is that. Saying sorry is a start but cheap, really cheap two generations on. “Sorry Mr Baird, but this ‘apology’ smells of tokenism and does nothing for the victims, their families nor the rescuers.” – Marilyn. Wendy Miles who lost two daughters, her father and stepmother in the Granville train disaster has made an impassioned plea for Australians to never forget the tragedy. They had come from England for a visit and were taking the girls out during the school holidays. “I looked out and saw them all going into the station and that was the last time I ever saw them,” Ms Miles said. When her day was interrupted by a news flash her heart sank. At the time Neville Wran’s NSW Government paid for a few funeral costs. No compensation was ever forthcoming.